Banjo Brothers Messenger Bag — The new design for 2006 has huge capacity and new shoulder strap design with quick-release buckle, plush shoulder pad, and one-handed, on-the-fly strap adjustment. Big reflective strip to help be seen. A great way to carry your stuff around town. I tested this bag since the day we received in back in May. So basically this bag has seen a lot of front line action. I’ve used this bag on commuting excursions that lasted from a couple of miles up to 34 miles in one day. It’s built with tough materials, shoulder padding is adequate. The quick release clip helps you get in and out of the bag without a problem. The fast adjustable buckle allows you to easily fit the bag to your needs. The bag is comfortable to wear. It didn’t shift or slide on me while I rode with it. The reflective strip on the bag helps drivers see me during the night. The bag also has slots on the shoulder strap so you can attach gear on to it like a cell phone, walkie-talkie, GPS device or anything else you need for easy access. Inside you’ll see ample room for business cards, pens and 2 pockets. The zippered pocket is perfect for keeping your wallet in or anything you want to secure. The material is made out or a durable, rubber like tarp which means it was strong. The bag itself did a good job in carrying my things and even the occasional Chihuahua. The bag did come with a soft protective laptop case that held my pc in place. I even used this case to keep my clothes from getting wrinkled on my commute. Check out the quality of the material. The bag has a white inside liner to help you see all your stuff easily. It’s perfect when you’re trying to find little things that might have slipped to the bottom of the bag. It also has two large pockets inside. 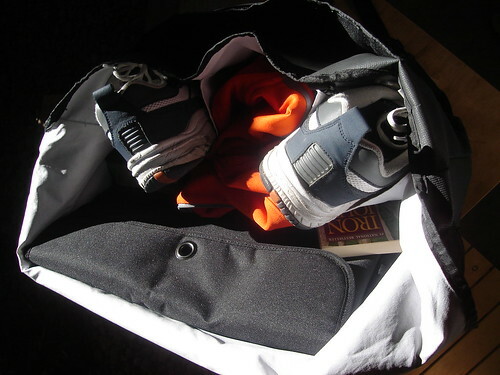 These pockets are perfect for putting in a U-Lock and it was large enough to keep my shoes in. I wanted to test out the bag in a very unique way. I’ve yet to see any other site do a “wet test.” I haven’t seen it because most bags wouldn’t do well in this type of test. 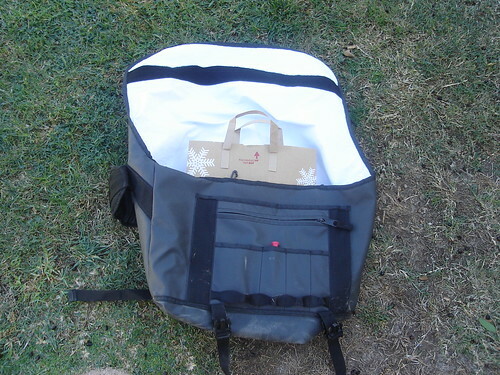 Since the material used for the bag is a tarp-like fabric…or plastic…or what ever you call it, I wanted to see how well it would do in protecting your precious cargo. So I pretended to be a Seattle bike messenger that had some important documents that needed to be delivered. No offense to the NYC or SF messengers, its only because it rains more in Seattle than any of those cities combined. Anyhow, see the brown paper bag inside the bag. Well that’s my precious cargo. I placed it inside the bag as I would a normal folder or piece of paper. Then I took the hose to it for a few minutes. 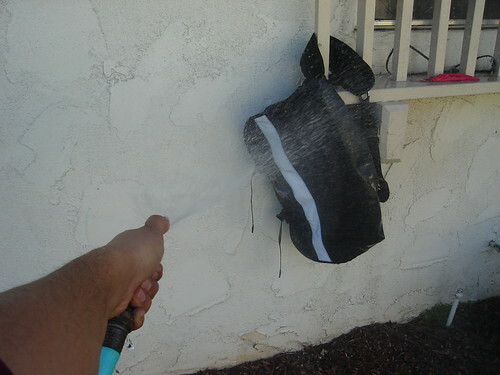 I would have had some one hose me off while I had the bag over my shoulder but no one was around to assist me. Once I was done I checked my precious cargo. Check it out! The paper bag was completly dry! Though the messenger bag was wet, but the inside was completely dry! The bag is works better than expected. 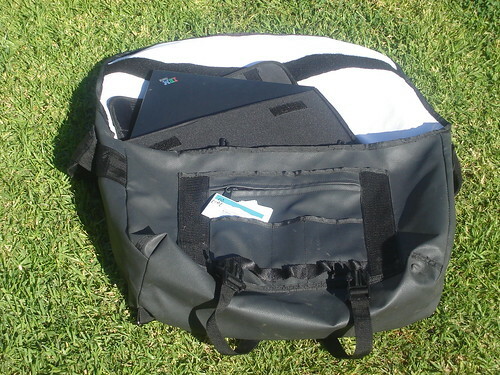 The wet test helps prove that the bag will keep your things dry during the rainy season. During the long testing period, I didn’t experience any problems with it. The bag is exceptionally priced at $79.99. That’s a huge savings over some of the bags out there in the market. Heck some bags of the same capability can sell up to $150! 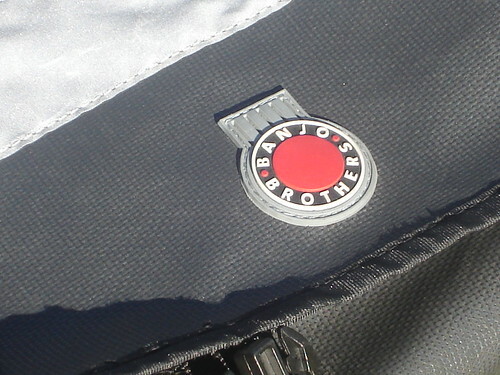 With all that said and seeing that the bag kept my precious cargo dry in a first time ever “wet test,” The Banjo Brothers Messenger Bag gets my FULL RECOMMENDATION! Any special “promo” price if we mention CbB? Sorry, my magical, super secret discount code of “RL is super cool” has no power with Banjo…Perhaps one day we will and when or if we get that worked out, I’ll post about it. I’ve been using a bicycle rack and trunk combination for the past two weeks for my daily 10 mile commute and I’ve come to the following conclusion: there is no way I’m going back to carrying anything on my back again. No more sweaty backs, no more shoulder aches, no more hunched over with weight, etc. As much as these bags look cool and make quite a fashion statement they just are not practical. As for people who say they don’t want to have the extra added weight of the rack/trunk on their bicycle all the time – mine is a quick release setup that I can quickly remove on weekends. If you think your rack is cool, think about getting an Xtracycle. We’ve done a review on it. 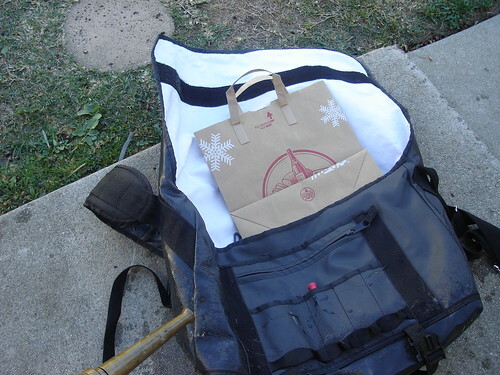 John: I’ve tried both ways, and personally, I prefer the messenger bag. I ride a light, nimble bike, about 20lbs with 700x23c tires, and panniers make a big difference in handling. Weight on my back is weight I can shift, and therefore use to my advantage. It’s also one less thing to deal with when I get off the bike and lock up. The panniers took a moment to unhitch, and had to be carried by hand. 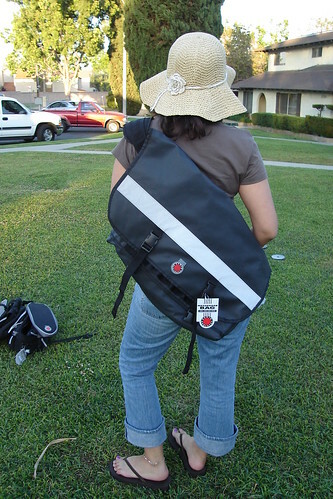 From what I’ve seen, people with already heavy bikes who ride in an upright position seem to prefer panniers, while people who ride in a more aggresive position and carve through traffic prefer to have their bags on their backs. Also, for fixed-gear riders who skip-stop reguarly, putting more weight on the rear of the bike makes it harder to lift the rear wheel to initiate a skid. Bad idea. I know this is an older post, but I was thinking about getting one of these bags. Does the rubberish / tarplike texture of the outside of the bag keep your back from breathing? (i.e. will you sweat more with this bag?). Or am I wrong about the material. From the pictures it looks somewhat rubbery. Thanks for any input. Cheers! Check out our designer messenger bags, and urban lifestyle bags. They are all domestically produced in small batches, and are built to last. We work really hard to design bags for the rest of the world. 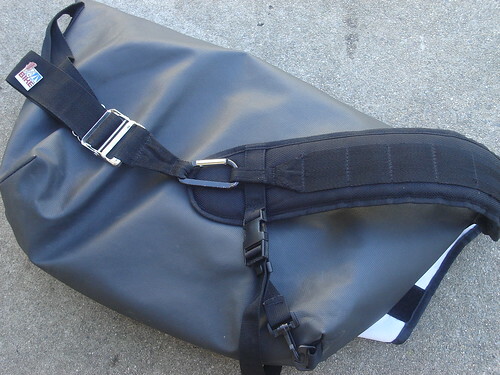 Those of us that don’t ride a bike for a living, but need a bag that can go on a bike ride and works. use coupon code pa1101 for %25 off any Tucker & Bloom product. Do your feet hurt when you ride?